The Oak, The Willow and The Bard is a poetry art book intended to be displayed as a "coffee table book" with poetry by Ameryst Oak and illustrations by Jon Hammond. Ameryst Oak began his journey as a Bard in the Pagan path of Druidry in the later part of 2010 after what is known as Samhuinn of that year after much searching and discovery of his spiritual journey. 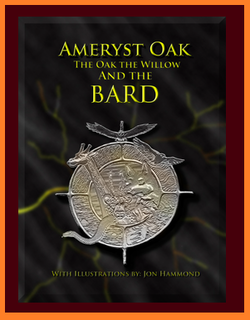 Since discovering the path of Druidry, Ameryst has rediscovered his ability of writing verse, poetry and a love for Story-Telling which is a part of the Bard's journey and under the spiritual connection with Mother Earth, the Awen, the Animal Kingdom as well as Trees (especially the Oak and Willow) has come to find that part of him. From his late teenage years as he entered study in 2 different colleges in his home town of Bristol (England) Ameryst discovered that he had a natural ability to write poetry and verse in his own unique way, yet never developed beyond scribbling during his days of study and not knowing what brought such writings to his untapped ability. Now, years later, Ameryst understands with new appreciation his natural gift, and by listening to the whispering wind that is the Awen, his connection to the Trees, and guidance from Nature that naturally flows, he brings you the first of his published works. soon as he could hold a pencil. After graduation he taught art and video production at his old school for a year, before moving to Seattle to freelance as a graphic designer. 2006 marked the birth of his daughter, and in 2010 he returned to Maine for the birth of his son. In Portland Maine, Jon became closely affiliated with the colorful artist/poet community, and began to emerge into a modest form of local celebrity.